Sony Electronics makes tens of thousands of products. But the launch of its Tablet S – going head to head with Apple’s iPad – called for something special. Adding to the pressure, Sony’s social media team had a relatively small budget for the project. With a creative mix of social media and in-person events, Sony brought out thousands of people to locations to “Catch the Tablet” and tell their friends about it. Most notably, the campaign created buzz that inspired 1,000 clicks from Facebook to the Tablet S pre-order page, making it the most successful social media effort yet for the company. A Sony fan "catches" the company's new Tablet S.
Sony tracked 41,437 engagements on the Catch the Tablet Facebook tab, including poll votes, clicks, shares and image and video views. The contest collected 8,800 eligible contest entries. The campaign inspired 1,769 tweets with the #CatchTheTablet hashtag during the campaign period. Sony’s Facebook fan base increased by 8% and its Twitter following by 4.5% during the campaign. 1,000 clicks were tracked from Facebook to the pre-order page on Sony’s website. How Do You Create a Viral Campaign? At Sony Electronics, a team of seven is dedicated to supporting the company’s thousands of products with social media. Understandably, the team focuses on select high-profile products, and the Tablet S was one of the biggest yet. 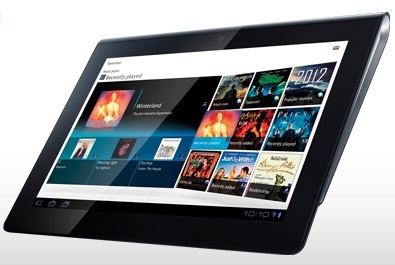 The Sony Tablet S launched in mid-September. “We wanted to increase awareness of our Tablet S, generate buzz in advance of the launch and drive in-store visits to Sony stores and dealer stores,” said Marcy Cohen, head of social media at Sony Electronics. “It was an interesting challenge for us to generate awareness before product availability and the only way to do that is by letting people touch and play with it,” she added. The goal: get as many people as possible to try the Tablet in person and encourage them to tell their social networks – in short, go viral. 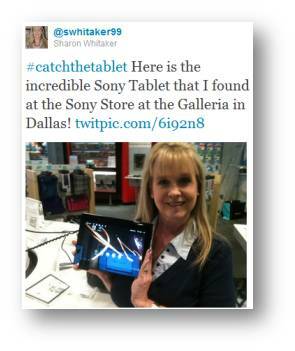 Working with Atomic PR, Sony came up with the “Catch the Tablet” cross-country tour. 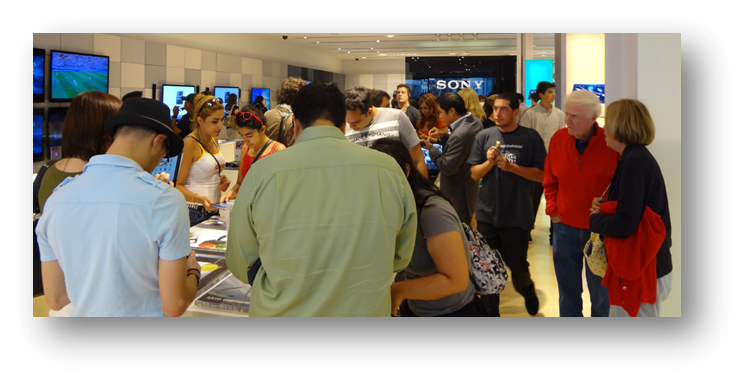 Starting two weeks before the launch, fans could try the Tablet in one of 32 Sony stores or at specific locations in select cities nationwide: New York, Miami, San Francisco, Chicago and Los Angeles. Fans would decide the sixth city on the tour by voting from among Seattle, Dallas, Atlanta and Boston. With Facebook as the home base for the campaign, Buddy Media created a unique tab on the company’s fan page. There, fans could find clues about where Sony’s social media team would be in each city, vote on the sixth city and enter to win one of the many Tablets Sony was giving away during that two weeks. 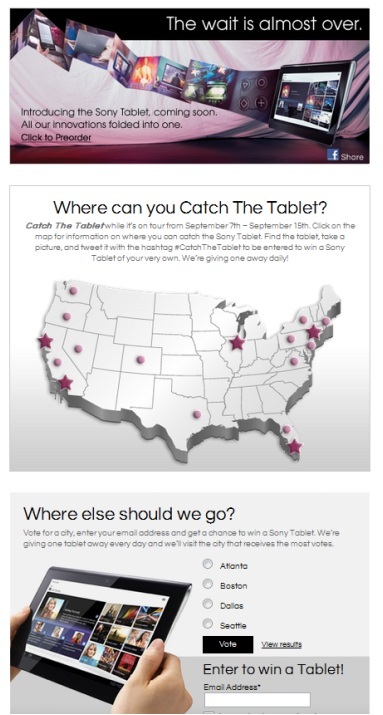 On a campaign-specific tab on the Facebook fan page, fans learned where they could "Catch the Tablet" and voted on the sixth city. On Facebook, people could also RSVP for events and find interactive maps to city locations. Sony alerted fans of the team’s whereabouts with Facebook posts, keeping them relevant to fans in specific cities with geotargeting. 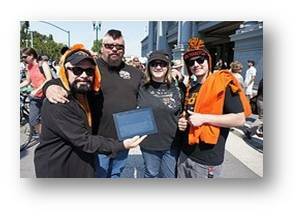 Spirited fans in San Francisco showed their support for the Tablet. To control costs, the core social media team traveled to all locations on the city tour, rather than hiring street teams, giving the team firsthand interaction with fans and the Tablet. The chance to try the Tablet S, and possibly win one, brought fans to Sony stores. Many of those who showed up at events or stores not only got a one-on-one experience with the Tablet but also took away free SWAG like t-shirts, buttons and cotton candy, and depending on the event, food and drinks. Though giveaways were small and inexpensive, Cohen says fans were excited to score free stuff and wear it. But the real draw was the chance to win one of four Tablets being given away each day. Fans could enter to win two ways: by submitting their emails on the Facebook tab or by taking a photo of themselves “catching” the Tablet and then tweeting it with the hashtag #CatchTheTablet. 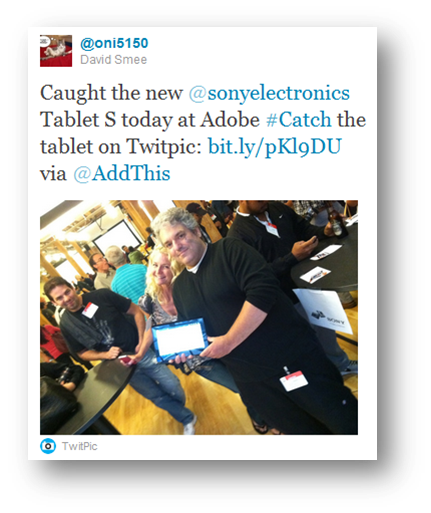 More than 600 people entered to win a Sony Tablet S by tweeting photos of the Tablet. By requesting a Twitter post to enter, Sony netted more than 1,700 tweets with the campaign hashtag, many of which included a photo. Out of 8,800 contest entries, 600 were from fans who “caught” the Tablet live. The U.S. social media campaign generated global awareness of the Tablet. Sony stretched its budget and reach by partnering with other companies in tour cities, drawing up to 600 people at some events. Those partner events included a meetup at Adobe, an exclusive tour of Google’s headquarters for Sony fans and a visit to TechCrunch Disrupt, all in San Francisco. In New York, Sony joined forces with GetGlue, which was already hosting an event. In Miami, it was a breakfast meetup at BGT Partners, a web development company that works with Sony. 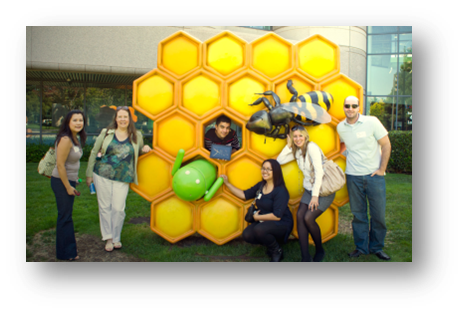 Sony fans toured Google's headquarters as part of a joint event. The city tour was just one piece of a major national campaign, which included TV and print ads and PR. But the viral impact of the pre-launch social media effort exceeded Sony’s expectations. The company tracked 41,437 engagements on the CatchTheTablet Facebook tab, including poll votes, clicks, shares and image and video views. In the process, Sony’s Facebook fan base increased by 8% and its Twitter following by 4.5% just during the campaign. Approximately 2,300 people weighed in on the tour’s sixth city location, with Seattle winning with 40% of the vote. 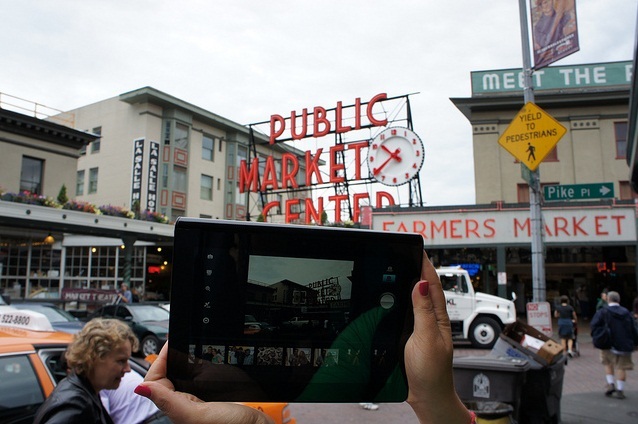 A Sony fan tries the Tablet in Seattle, which won a Catch the Tablet visit with 40% of the vote. The 1,000 clicks from Facebook to the pre-order page were the best evidence that the team’s efforts drove real interest in buying the Tablet, giving Sony momentum as it headed into the actual launch. “We were very pleased with pre-orders,” Cohen said. The campaign’s success now has Sony teams around the world talking. Give people multiple ways to enter contests – The team learned that many fans were not on Twitter but were on Facebook. “Offering your users a choice of platforms is really important,” Cohen said. Team with others – Partnering on events expanded Sony’s reach and kept costs and legwork down. 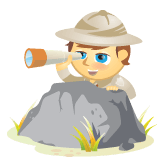 Geotarget your Facebook updates – Stay relevant for your fans by not showing updates about specific locations to the masses. What do you think? How have you effectively used social media to drive people to in-person events? Leave your questions and comments in the box below.